As a gardener, you may have tried to water the veggies using only the garden hose, and it may not have gone so well. Water coming from the hose tends to go in one flow which may be stronger than your struggling buds. You also take so much time to water the whole garden. You may even have tried to demonstrate your ingenuity with a finger as a nozzle, but the cold and numbness is something else. The fact that you need a hose nozzle is apparent. Anyone would expect you to have one. However, the market is awash with numerous products making the task of choosing the best one difficult. Below we provide a list of 5 best hose nozzles you can choose from. There is an overwhelming significant number of hose nozzles on the market with each functioning differently from the other. The following are some of them. The good thing about this kind of nozzle is that the user has the chance to vary the watering pattern. You will find mist, shower, cone, soak and flood – you just go with the most fitting for you. Dial hose nozzles are the most appropriate if you are dealing with plants such as potted flowers as it allows close watering. Plants that are just sprouting or budding need to be treated delicately and the mist setting is the most appropriate. Hose nozzle resembles a pistol with a lever to switch the water on and off. You vary the flow of water depending on the amount of pressure you place on the lever. Releasing it completely turns it off. In comparison to the other types, pistol grips are weaker. You vary the pattern and flow of water in this nozzle by twisting. This type of nozzle is the best when dealing with water that needs to come out with a significant amount of force. They are also quite durable and will last decades. This type of hose nozzles gives out water in the shape of a fan. They are appropriate for flower beds and other smaller gardens. While the majority of them have no shutoff valve, they are ideal for those in a hurry to complete the task and go to something else. This nozzle allows you to reach far when watering. It is especially useful when dealing with hanging baskets. Watering wands vary according to features. Some have insulated grips for comfort when dealing with the water – no cold. Use: Before anything, you must consider how you are going to use the nozzle and choose the most appropriate according to your needs. Every gardener worth his salt should go with nozzles that have both the mist and spray options. 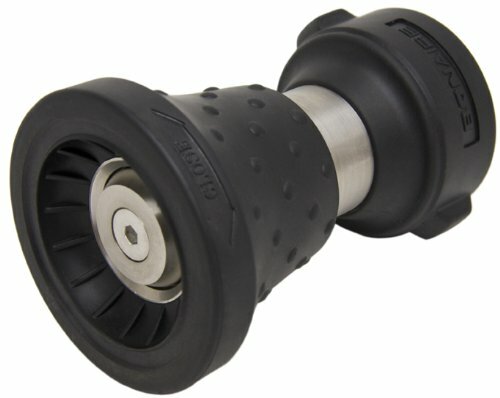 If you are getting one to clean your vehicle, then it should be rugged enough to handle drops on the concrete floor. The material: the handle and the sprayer are the two major parts of hose nozzles. You will find nozzles made entirely of metal, but the majority of them have both plastic and a metal part.If you choose to go all the way metal, then select aluminum, brass or zinc construction. Be sure you will be in a position to comfortably handle the weight for more extended periods of time because they are heavier than the plastic types.You are also at liberty to take the hybrid route – where the hose nozzle has both the metallic and plastic parts. If you do, chose the one with a plastic nozzle and a metal nozzle and you will be alright.Avoid all-plastic hose nozzles like the plague. They break quickly when exposed to sunlight for extended periods. These nozzles are also more likely to leak. The flow rate: depending on the pressure of water and style of the hose, the flow rate varies significantly. You may see some manufacturers indicating the flow rate, but it is not something that you need to place much importance. The spray pattern: depending on the plants you are growing, the spray pattern is an essential factor to consider. A hose with variable patterns consistent with growth stages of the plants will be most appropriate. Don’t run for a hose with one strong pattern that will affect your plants considerably. Shut off valve: having the ability to switch on and off water flow in a hose is essential. You should be able to do this if you are using a real hose nozzle – after all, this is one objective of going for one. If it comes to it, chose a hose nozzle with a durable shut off valve. It should also shut off the water completely. The diameter: the diameter of the hose determines how much water can pass through it. Typically, you are much better placed with a 5/8 inch hose in your garden. If you are looking for something durable and worth every cent of your cash, then this product may probably not disappoint. This hose nozzle is made from 100% metal and will readily take any abuse you met against it. The hose nozzle comes with a rubberized nozzle tip and so dropping it a number of times is not an issue. You would typically think that being all metal would make this product hard to use. Far from it, this hose nozzle has a grip that is considerably comfortable to use for extended periods. The jet pattern is comparably the weakest. 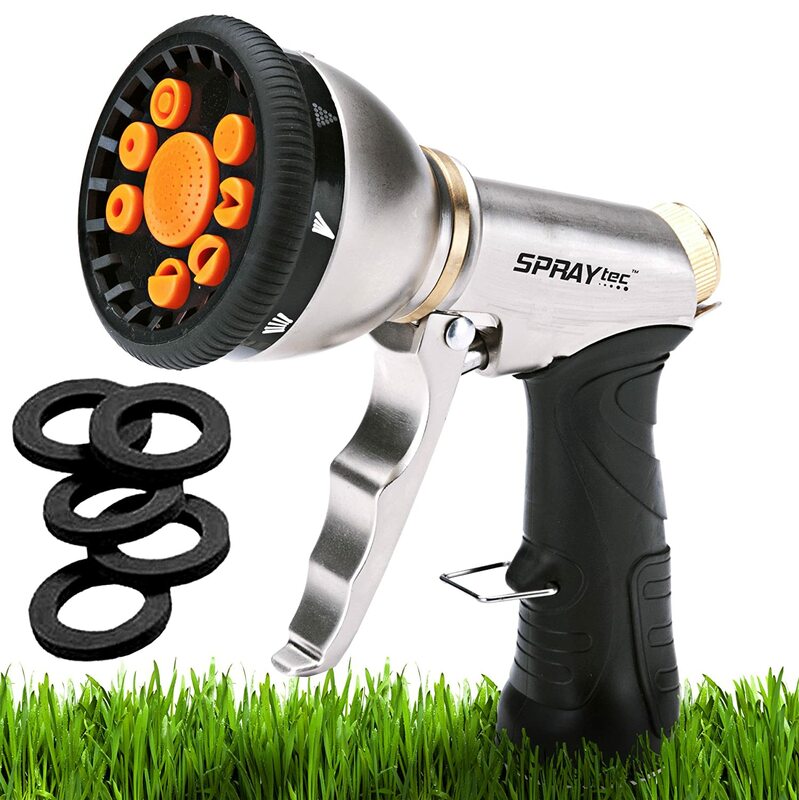 This garden hose nozzle comes with nine spray patterns that every gardener will find useful. 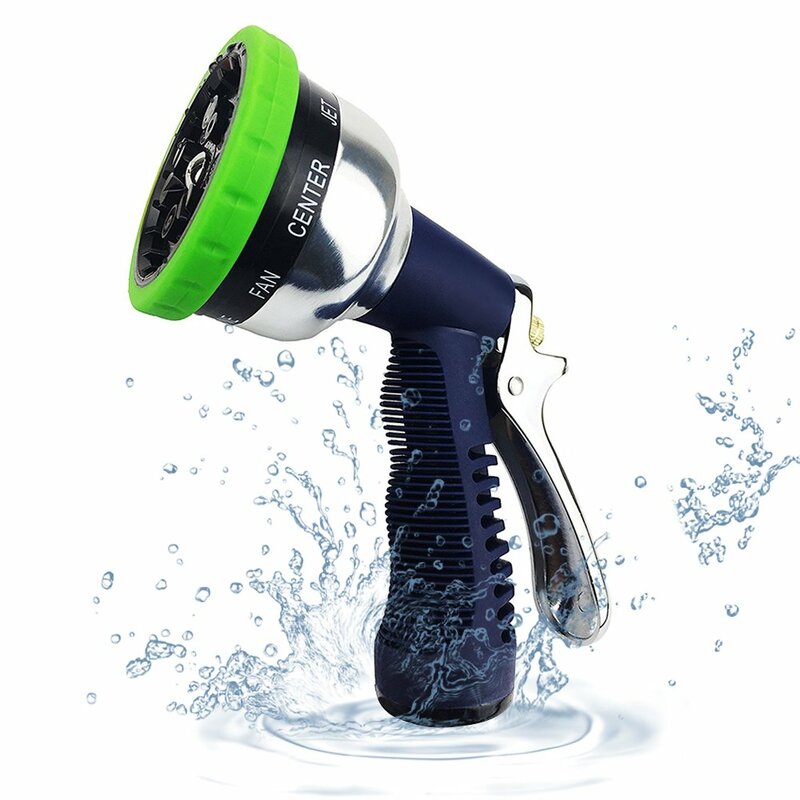 The nozzle is made of solid steel and enamel making it quite durable and will not have to worry about constant drops now and then. You will also not need to worry about corrosion or rusting since this hose is anodized. The product has a rubberized bevel quite tolerant to shock. To make your task easier, this hose nozzle has a lock bar you will find at the top and which you can quickly turn when watering relieving your hand from the pressure. The lock bar may sometimes get stuck. Apart from the nine patterns, you can choose from, the hose nozzle has a functional side knob for varying the water pressure. This product also makes your watering task pretty easy as you don’t need to keep holding the trigger – this can really be tiring. If you have been using hoses for some time, you may have noticed that leaking is a common problem for most of them. However, this hose nozzle is leak-proof. This nozzle possibly transforms any hose you have around into a multifunction one. The nozzle has five patterns that any gardener will find valuable. Furthermore, the steel construction can take years of constant abuse in the garden. It is easy to use, and all you need to do is turn the head to choose the appropriate pattern for your kind of job. 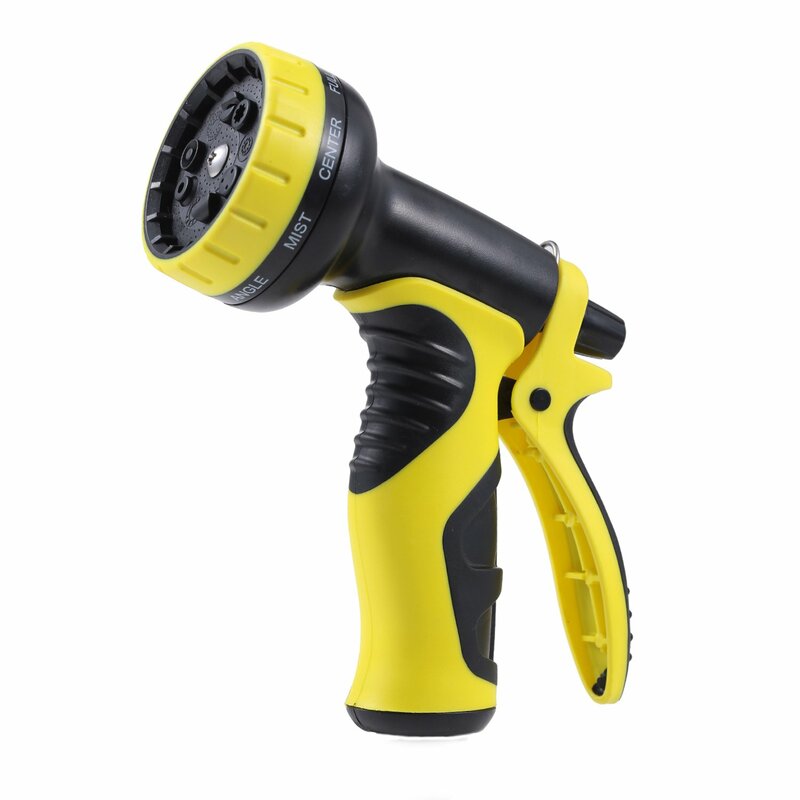 The hose nozzle may be quite comfortable on your hands because of the rubberized non-slip grip. Should you feel that the hose is clogged, you can, as well use a screwdriver to take it apart and remove any debris. Has a two-way shut-off valve to control the water and comes with a one-year warranty. When shopping, everyone wants something durable and functional – something that will keep them away from the stores for a while. 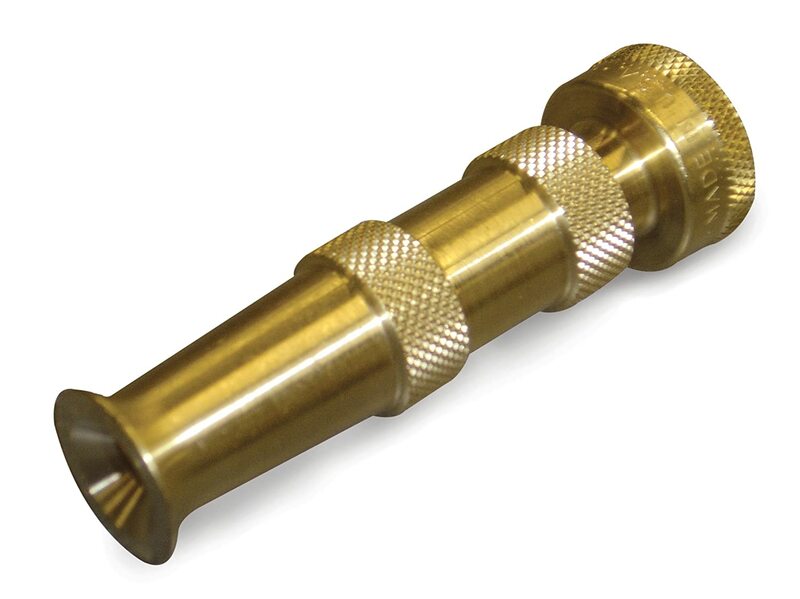 Talking of ruggedness, this brass nozzle is the precise definition of the term. It is a functional nozzle that you can use in a variety of ways. The flow volumes, as well as, the spray patterns are at your fingertips. It is easy to use as you just need to twist the barrel to the pattern that you want. Hose nozzles are some of the most essential tools to use in your garden or around your homestead. You can water the vegetables using the gentlest of water patterns, or you can clean your vehicle with a powerful stream. To that effect, your hose nozzle needs to be functional and easy to use. The above list contains some of the best hose nozzles in the market. However, the Bon-Aire HN-10C Original Ultimate Hose Nozzle is a good choice. It is rugged, functional and easy to use. If that’s not all, the product is easy to put apart should there be jamming. See the best garden hose reviews online.